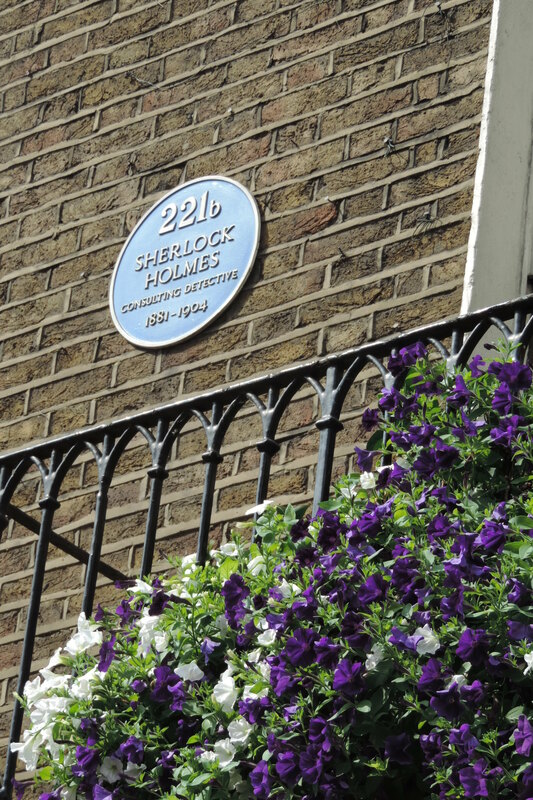 He’s one of the world’s most famous detectives with one of the most famous addresses in literature: 221B Baker Street, London. 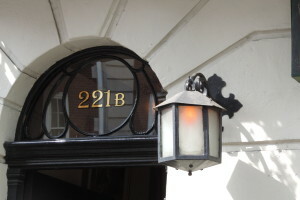 Sherlock Holmes’ fictional address is the real address of the Sherlock Holmes Museum. 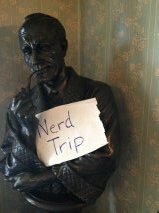 In summer 2013, I waited in line for two hours (including two brief rain storms) to tour the townhouse of this fictitious figure. The popularity of the museum reflects the popularity of Holmes’ himself – likely fueled by the recent BBC/PBS series starring Benedict Cumberbatch. The girl in line in front of me was obsessed! Elementary my dear Watson! 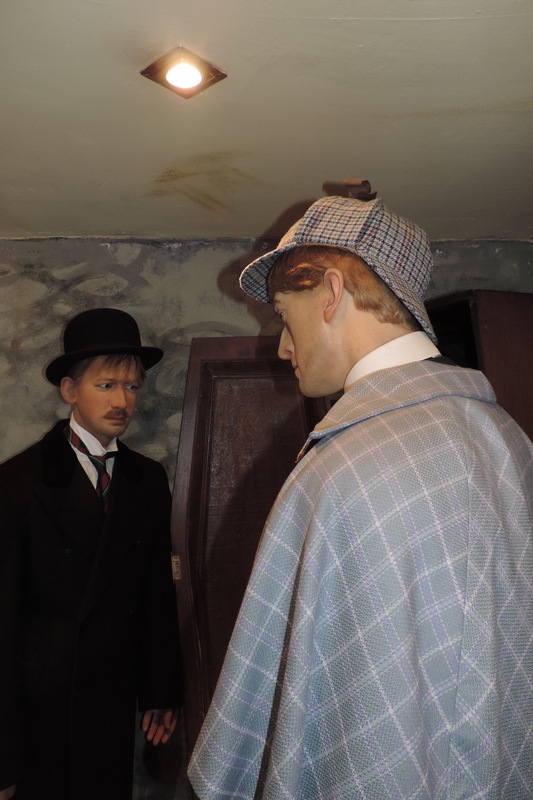 Check out these characters at the Sherlock Holmes museum. 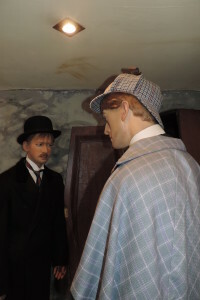 For me, the attraction of the Holmes museum was the spectacle, including the elaborate details and displays, and endless souvenirs for a person who never really existed – ridiculous, cheesy fun! I was all in. You buy your tickets in the house next store, which serves as the gift shop (see our “On the Map” page for address and bathroom info). 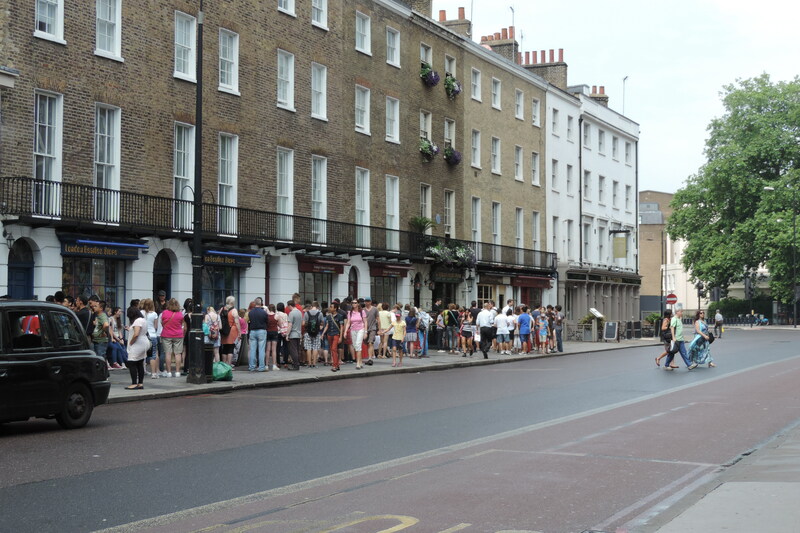 Then you get in line outside, a line that stretched down the block. There were people from all over the world, and I had a great time talking up the Holmes’ fans. My friends who were staying in London that summer report they often saw a very long line at the Holmes’ museum. A man dressed as a British bobby guarded the door, allowing about 1o people in at a time, usually about every 15 minutes. I was pleased to see that Mr. Holmes has a blue plaque on his house, marking his residence as the home of a prominent person in London (even though he’s fictional). The dates on the plaque read 1881 – 1904. 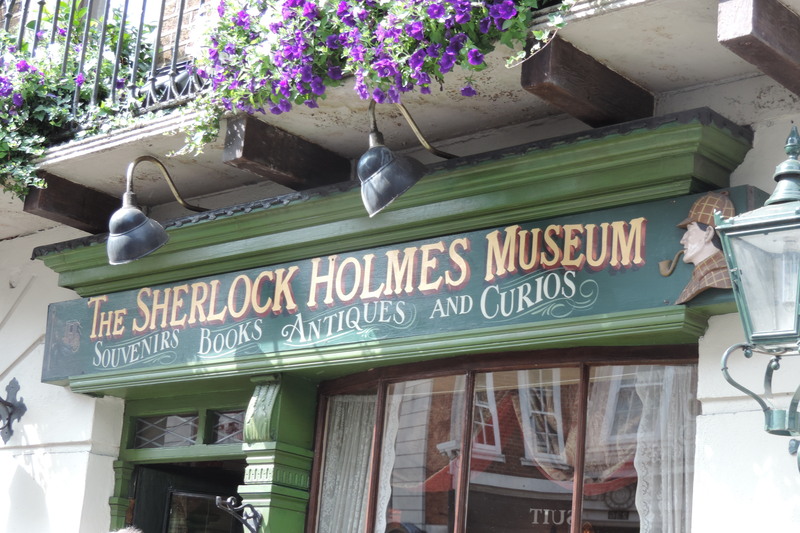 According to popular deduction, March 4, 1881 marks the beginning of Holmes and Dr. John Watson partnership. So, get out your deer stalking hat and magnifying glass because in the next post, we’re going inside the home of Sherlock Holmes, consulting detective. 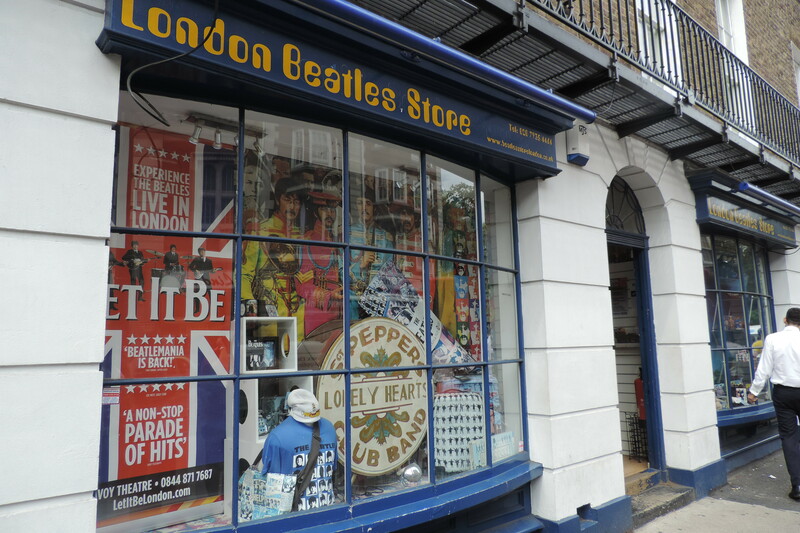 Just FYI: While in line for the museum, you can check out the amazing array of merchandise at the London Beatles store. I agree with the fanatic in ahead of you in line – the BBC series with Cumberbatch is awesome! 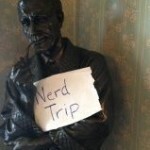 Love Sherlock holding the Nerd Trips sign. As much as I love period houses, that line would have made me turn and run. Submitted on 2014/01/17 at 9:08 am | In reply to thehistorytourist. When I got in line, I wasn’t sure how long it would be, and then I was committed. I just couldn’t imagine what would be in a house for someone who never existed! Submitted on 2014/01/17 at 9:10 am | In reply to Steve. Just this week another friend was telling me how amazing Cumberbatch is. Do you think I need to watch the seasons 1 & 2 first or I can I start with season 3? Submitted on 2014/01/17 at 12:25 pm | In reply to nerdtrips. I will have to look for that. Thanks. Submitted on 2014/01/17 at 9:09 am | In reply to lemanshots. To me, it’s very bizarre because you are touring the home of a fictional character.